Should you read any or all, I encourage your placing a review on Amazon. I have been diagnosed with a severe case of rectal cancer that might take my life. I can accept the hand I have been dealt (because of my faith), but if my medical treatment fails, I am haunted by fear of my wife’s future well-being. As a self-published author I know expectations of financial wind-falls from the sale of my novels are a pipe dream, but any royalties in the future could help her survive without me. I need to position my novels so they may sell in the future, and two items that may help this to occur are to generate large numbers of reader reviews and increase the number of books sold. To this end I am offering the Kindle editions of all three novels for 99 cents from Wednesday, August 31 through Tuesday, September 6. I would appreciate anyone providing reader reviews posted to Amazon. The reviews need not be long and wordy. Each 99 cent purchase will help with sales numbers. THE BLANKET HILL INSURGENCY, a novel of Baby Boomers caught in the slowly developing cultural war of the sixties fueled by the War in Vietnam resulting in the shootings at Kent State University. Kindle link of http://amazon.com/dp/b01b26ljfu. TARNISHED VALOR, a novel depicting the struggle Veterans of the Vietnam War endured when returning home bearing scars of war while facing a society that changed during their absence. Kindle link of http://amazon.com/dp/b01dt1q6hm. Each novel is also available through Kindle Unlimited and in print of both standard and large print versions (print versions are not discounted). I would also appreciate sharing of this post. April 22 will be the seventieth anniversary of 441 prisoners of war (365 British and 76 American) starting a cross-country march from a prison in Rangoon, Burma. As Allied forces approached, the Japanese were intent on shipping their POWs to Japan. One of the POWs was my uncle who would gain his freedom three days later following seventeen months of enslavement. In honor of the heroics of these men, my inspirational novel of an American Airman’s enslavement as a Japanese Prisoner of War will begin a seven day Kindle 51% discount special at $1.99 (FREE for Kindle Unlimited). BREAKING LIBERATOR’S SHACKLES http://amazon.com/dp/B00UD6040C, masking history in fiction, provides an accounting of the crew of an American B-24 Bomber, tail number 273312, that went down in a Burma marsh in November of 1944. 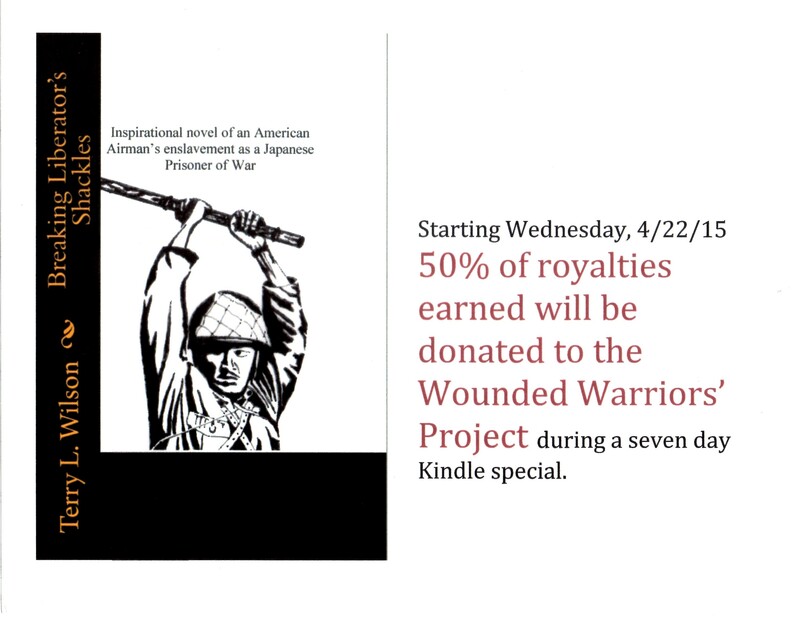 HALF OF THE ROYALTIES EARNED DURING THIS SPECIAL ARE EARMARKED FOR DONATION TO THE WOUNDED WARRIORS’ PROJECT. Also half of the royalties for sales of my other novel, THE BLANKET HILL INSURGENCY http://amazon.com/dp/B00UAO66WW during the special will be donated to the Wounded Warrior Project. These donations apply to all Kindle and paperback copies sold through Amazon. “…Terry Wilson has a knack for writing war novels that keep the relationships of his characters in the forefront. Enjoyable read!” Melissa. “This is a story of courage, of love and of healing, and I enjoyed it.” Diana Wilder. ALL SHARING OR RETWEETS OF THIS POST WILL BE APPRECIATED.